WOW! What a night and what a DJ ... Russ did such an amazing job I don't know where to start ... He has to be the most personable man I have ever met and kept everyone happy, entertained, smiling, laughing, singing, and enthralled the entire evening. They are still talking about it. We are a Navy group of shipmates and wives who have a yearly reunion and were looking for something different and fun for our hospitality room. Russ provided all that and more. He brought along "Carol" who videoed the entire evening and spoke with all the guests. What a treat that will be when we all get to relive the evening by watching the DVD. Russ covered a huge array of subjects ... starting with singing, joking, recognizing our anniversary couples, birthday people, our new association officers, the shipmates who have passed on during this last year, and so much more. We had such an amazing time that it seemed to pass too quickly. No one was ready for the night to end. The way that Russ interacts with the audience is to die for ... for instance ... "I need a volunteer from each table ... do you want to pick them or do you want me to?" No one knew what they were being chosen to do but absolutely everyone joined in gladly. That's just how comfortable Russ makes you feel. It's like he has been our very own personal friend for the last 25 years. He had people dancing that said they totally "can not dance" ... WRONG!!! They could dance and we all clapped to the music. You just can't sit still when Russ is in the room. Russ gave us a good hour and a half of fun, happiness, and levity. For the last half hour he paid tribute to our Navy men, reminded us all why we were there and together for the reunion, about the great nation we are proud to be a part of, took a moment of silence for those of our friends and shipmates who have passed on, reminded us that "Amazing Grace" is one of our greatest gifts, allowed us to join him in the singing of "God Bless America" and closed our evening with the playing of ... what else? ... "Anchors Aweigh." It just couldn't have been any better. We were in charge of the entertainment for this reunion and we are still receiving accolades for this particular evening. How rewarding. Now ... the dilemma ... how are we going to top that or even match it for next year? I believe (unless we can convince Russ to travel to Portland, Maine) that we can't come close. Our recommendation is for anyone reading this and considering hiring entertainment for a function ... HIRE RUSS ... he's the best and you really won't be sorry. If you have anyone in your group by the name of "Sue" you might warn them that he is very fond of the game "Let's pick on Sue." I kept telling him he was "fired" and he kept telling everyone via the microphone that I said he is was"hired." What a night!!!! What a tremendous get together!!!! What an entertainer he is!!!! Sign Russ for your get together and you will absolutely love him and you will never regret a moment. Hire him and enjoy!!! We did!!! Picking a DJ from a website is a little nerve racking. When I first saw Russ' website, I was totally sold and hoped and prayed he would live up to the expectation from the website. Not only did Russ meet my expectation but he exceeded it. For such an important event as our parents' 50th wedding anniversary we wanted to put together a very special party. My sister and I both were convinced if you had just an "OK" DJ the people probably wouldn't have a good time. It was very important to us to have a "GREAT" DJ and boy did we find him. Russ gets to know you and your family as if he's been a part of it forever. One time during the party I even referred to him as "Uncle" Russ. He got the party going and kept it going all night. There wasn't ever a request that he wasn't able to deliver. Russ is definitely the guy you need for your event. We had a DJ, and MC, a singer and an entertainer all rolled up into one guy. Our age group at our party went from 2 years to 83 years and music was played for all. He is worth what he charges. Russ, thank you from the bottom of my heart for making my parents' night a very special event with your talent. We are a bunch of Italians who love to have fun and be with each other. Thanks for wrapping it up for us with "We Are Family." You will always be our first choice for any future DJ needs we have. The family has all asked me to keep you "bookmarked" in my computer! Russ we sincerely loved you. Everyone enjoyed themselves at the wedding but most importantly as the bride I didn't have one moment of worry. You had everything set up, you were a calm professional who was very well prepared. I found it very reassuring knowing that my ceremony and reception were in your hands. You really do go beyond and above what is required. You were very highly recommended and it will be my absolute pleasure to recommend you to anyone who would ask. My guests were very impressed with you and loved how you got them out and moving. By the way, what a beautiful voice. I thought we dancing to a Frank Sinatra record when we realized it was you. I could go on and on but there isn't enough room on this sheet. I am so glad to have had you at our wedding. I hope there are more events with you as our DJ. 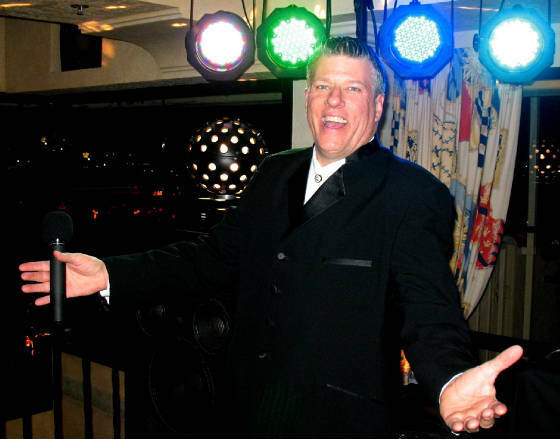 Russ McKamey is the ULTIMATE fun, upbeat, and all-around entertaining DJ! I couldn't have imagined having anybody else DJ and EMCEE my Husband's Surprise 40th Birthday. From the moment I saw his photo on his website, I knew he was the right guy for my event. When I spoke with him for the first time on the phone, his fun, warm-hearted and carefree personality was even more apparent! Every testimonial that I read was absolutely true! The smile on his face in every photo was exactly what I saw all night long at our party! He was NONSTOP fun!!! If you are looking for a DJ who is high energy and an all around fun-spirited person, yet who can adjust to the exact atmosphere and environment of your particular event, RUSS is your guy! His customer service was bar-none! He returned every phone call I made, and every email in a timely manner. He was so cooperative, professional, and at the same time warm and friendly to me, every time we communicated! He accommodated every request I made and gave me plenty of suggestions for games and entertainment as well. His musical selection is tremendous, and he will get any song your heart desires! His lighting equipment is TERRIFIC, and was a tremendous enhancement to the atmosphere of the room! Russ' karaoke equipment is the most modern I have ever seen ... and it was a huge hit at our party! Russ had us playing "Rock and Roll Trivia" from the year 1966 (the year my husband was born), which was also so much fun! I can't say enough great things about him! I would hire him again in a heartbeat the next time I have a party and am in need of a DJ! THANK YOU RUSS FOR MAKING GARY'S 40TH BIRTHDAY A BLAST!! Thanks for making our wedding reception on Sunday run so smoothly despite our busy schedule. Without you we could not have done it. We are so grateful that you were able to keep the crowd entertained while we were out taking pictures with the photographer. You kept the party going throughout the night with great music. Even the young kids at the reception would not stop dancing. We loved how you made the garter, and flower toss, an extremely exciting event. We also loved how you kept rocking until the very end of the night when all of the older folks had gone home and we could really let loose. I saw some people dancing that said they don't ever dance, and they were all having a great time. Even my Mom and Dad were getting down with some K.C. and The Sunshine Band. It was also so fun to see all of the conservative nurses from Scripps Mercy Hospital dancing to "Night Nurse" from Gregory Isaacs. We would highly recommend you to anyone that needs an entertainer and MC (so much more than just a DJ)! I found Russ on the Internet, so he first scored points with me because I could evaluate his offering at a time that was convenient for me. I sent an e-mail and he responded with the information I wanted, confirmed my date was available, and quoted a price immediately. Whenever I asked a questions, he responded. Many wedding vendors don't get back to you or communicate quickly when time is of the essence. We made all arrangements without even exchanging a phone call. And he was there on time with all his equipment set up and doing a wonderful job when we arrived! Russ can sing extremely well, but he doesn't turn your event into his talent show. He adds value at opportune times. He has great equipment and knows how to work the crowd. We had so many guests who went out of their way to tell us how great he was. He respected our schedule, but was able to improvise when we asked. Some family singing, speeches, song requests were all impromptu, but Russ handled it all well. Even calling the tables for the buffet had flair. He had guests from 3 to 80 years old on their feet dancing and having a good time. Even people who claim they cannot dance gave it a try. One of our other vendors was even dancing when he was on a break. I have been to receptions and parties when few people dance, including me. You know the feeling ... lots of blank looks and a furtive glance at your watch to see how soon you can escape. Not the case here. I was surprised how many guests stayed until the end and even danced the last dance. This was an afternoon reception; I can only imagine how much fun he would be at an evening event. Russ, you were amazing! Everyone had a fabulous time and you were responsible. Your choice of music, timing and interaction with our guests was absolutely perfect. You bring so much more than just the music to a party. I don't want to spoil the surprise to your other readers, so you may want to leave the part out about how we were so impressed with you as a singer (certainly didn't expect that!) and the added bonus of your lovely wife taking all of those cherished photos. You sure can tell everyone had a wonderful time. No one was too old to get up and dance and keep on dancing. I have and will recommend you to everyone we know as will our guests. I am happy to assure anyone that they will be absolutely thrilled with you. You're the best DJ we've ever seen ... Thanks a million! I am so happy I found Russ! He was everything I expected and more! He was the life of the party, getting everyone to participate and have a great time! He was loved by all the guests and some are already asking me for his number for their events. He did an amazing job as a host/emcee/DJ and was on time with everything! He made my wedding reception memorable to all. We had a WONDERFUL time!! THANKS RUSS!!!!! I have had more positive comments about the wedding and reception from family and friends then you can imagine. Everyone can't stop talking about how much fun they had with Russ as our DJ. Everyone was very sorry to see the event ever come to an end. Russ managed to take the groom's side of the family and the brides' and blend them into one big happy group for a few magical hours. My sister is still talking about the the way Russ interacted with the audience ... perfect! He has such a warm and fun personality. He was such a great find for my daughter and me. I found him on line, and the pictures from his website absolutely tell the true picture of what he is like. The service is provided, and his performance was awesome! Nothing boring about this guy, that's for sure. When I talked costs with Russ, he was so accommodating regarding my budget and time frame of all the things I needed to have completed. Everything ran so smoothly because he really plans ahead. He spent a ton of extra time we me ensuring all the wants and needs of my daughter were taken care of. He went way above what he needed to do and I really appreciate that. The time line that he made for us based on the his on line wedding planner was perfect in every way. The whole experience was one I'll always remember. Thank you so much for the incredible job you did during our recent wedding reception. Everyone really enjoyed the fact that you played such a wide variety of music, and had such extensive karaoke available as well. That was the kids' favorite part! Your interaction with the guests was very much appreciated, and leading us all in a song and dance was so much fun! Thank you for being so considerate with the lights and the time issue we were under. You really did a superb job accommodating all of our requests; and for that we are truly grateful. The energy and excitement received by all from you directly contributed to a spectacular evening we will remember for a lifetime. Thank you so much for all that you did. It was wonderful and amazing! The music was great ... just our style!!! I'm so happy that you had Kid Rock for my father!!! That was the best!!!!! My mother-in-law has already asked me for your number and website for her parents' party. My friends who were also there are getting married in October, also wanted your information so you can do their wedding! Everyone keeps telling me how the music was great, and the way you were so interactive with them made it such a fun and relaxed environment. THANK YOU SO MUCH!!! Dear Russ, We are the grandparents of the groom and were very impressed with how you helped coordinate all of the wedding activities. We were especially impressed and overwhelmed when you called us up in recognition of our 58th Wedding Anniversary and sang the most beautiful rendition of "I Can't Help Falling In Love With You" that I have ever heard. I'd pick you over Elvis Presley any time. not only did you make the day special for the bride and groom, but for all those attending as well. Thank you so much! Dear Russ, We got your CD today. Words cannot express how moving and beautiful you made our special song, "Can't Help Falling In Love With You." You are truly an exceptional, talented artist! We were so pleased with all of the songs you included, but especially "Unchained Melody," "Yesterday," "Bridge Over Troubled Water," Gentle On My Mind," "Music Of The Night," and of course, "Impossible Dream." Your arrangements and singing of these popular classics was truly outstanding. Most impressive was your performance of "Music Of The Night," a challenging piece of music which clearly demonstrated your ability and virtuosity. Again our heartfelt thanks. This CD is something we will always treasure. We are so happy that we chose Russ as our DJ!!! As planning any wedding or big event is stressful, it was great to see that our choice was a good one! He was on time and ready to go when we needed him. His personality is very friendly and he is charismatic with all of the guests. He made sure everyone was having a great time. All of our guests, both young and old, had the best time because of Russ. He cooperated with our photographer on the time line given, he was a great emcee AND he can sign! I really appreciated how he seemed to "read" the crowd and played music to keep things upbeat, or slowed things down at the right times. I loved that he got everyone involved. I would recommend Russ to anyone, and I would use him again if needed. Thank you Russ for making my wedding reception the best! Dear Russ, Bob and I can't thank you enough for making our son's graduation party a complete success. My friends and family truly enjoyed your music and are now convinced that you are "THE MAN" to call for their next party event. Even though it was an extremely hot summer day, your popular music selections did not stop my friends from dancing and sweating all afternoon. Also, having you act as my emcee, karaoke singer and DJ all in one, really helped me keep my guests entertained. Thank you very much Russ!!! On a scale of 5, this man is a 10!! And as a hidden bonus Russ can really sing. We had no idea of his hidden talent. Everyone at the wedding enjoyed his enthusiasm and vigor to make the event fun and fresh. His ideas and suggestions were very helpful especially at the last minute before the ceremony when panic set in over the wedding party. Thanks Russ for all your help. Russ absolutely MADE the party. Everyone just LOVED him and commented on not only how great he was personable, warm, energetic, musical (wonderful voice), but they also stated that he was the best DJ they ever heard. His intimate style is wonderful (e.g. the way he "works" the room and interacts with the guests and the honorees). I just can't say enough. Russ was just perfect and the party would not have been the same without him. He really made our event a rousing success. Like I said, everyone just loved him, and I am so grateful to him. Better book Russ before he wins American Idol!!!!!! I received NUMEROUS positive input from employees that attended the luncheon. Not one negative comment ... Russ was dynamite!!!!!! Overall satisfaction of Musical Excitement with RUSS on a scale of 1 to 5 ... an 11 plus!!!!!! Russ did a fabulous job at our wedding. Everything was perfect. :-) Everyone had a great time! The feedback from our guests was overwhelmingly positive. Russ not only made our event incredibly special, he helped take a lot of the stress out of the pre-wedding planning. We really appreciate all of your behind-the-scenes efforts that made the event go off without a hitch! If you have the opportunity to utilize Russ and his services, DON'T HESITATE!! Thanks Russ for your hard work to make our day special! Seriously, talk about a stress reliever. I gave Russ the few key songs and ideas as far as what I wanted and let him do the rest. Did I mention that I gave it to him the day before the wedding? We ended up having the most awesome party! You would have never known that I gave him the details at the last minute. Only problem is that I never left the dance floor to make my rounds! Just don't forget that part. It was better than I could have asked for. He knows what works and what doesn't. It was AWESOME and he is totally affordable in comparison. I was impressed that Russ was able to do all the planning with me on-line. When you're a busy bride, timely cooperation is extremely valuable! Russ handled everything just as we had planned as well. Russ was set up and ready to go without any interruption to our event. He was dressed up for the occasion, and was very professional. He knew what he was doing with every aspect of our wedding. He took the pressure off what to do and when by keeping the mood of our event flowing in good harmony all evening. Thank you again Russ, we'll certainly look to you for DJ needs in the future! Russ was a terrific DJ and host for my wedding and reception. First of all, he was very professional and courteous with handling the planning before the wedding. He returned phone calls promptly and always had an upbeat attitude. During the wedding he did exactly what I asked which was a combination of playing a few of my favorite songs combined with Russ choosing appropriate music at his discretion. He was tasteful, yet fun and entertaining with the music selection as well as the announcing. He kept things lighthearted and fun without being cheesy, which is what I wanted. Russ stayed charismatic and lively the whole night and worked hard to keep everyone alive, while keeping the reception events flowing along. Overall, it was a nice mix of a traditional wedding reception and fun party. I am very glad I had him organize the money dance for us. I had my doubts about it but it turned out to be a nice way to spend some time talking to each of the guests who came to dance with me. Not to mention my husband and I made nearly $300, which was surprising considering the size of our wedding. As an added bonus, Russ's assistant came along and took literally hundreds of digital photos of everything, which Russ sent to me at no extra charge. Russ made our wedding celebration fun and memorable for all in attendance. We were most impressed with his professionalism and enthusiasm. He acted like our wedding was as important to him as it was to us. Russ is reliable, organized, and listens to his customers. I would strongly recommend Russ to anyone planning to host a party or wedding. Russ MADE the party! He was enthusiastic to the very end, and nobody wanted to go home! Great mix of music go everyone involved. He went above and beyond what we could have ever hoped for. We will definitely have Russ back, it wouldn't be the same without him! Russ did a fantastic job for us at our daughter's wedding. He arrived in plenty of time, ensured that all our special song requests were taken care of, and he was so easy to work with. We had lots of people tell us the next day that he was the best DJ that had ever seen ... he really kept us hopping! In fact, we had him stay and play an extra hour and a half because everyone was having such a great time. I highly recommend using Musical Excitement with RUSS as a DJ. I would like to take this opportunity to highly recommend Musical Excitement with Russ. Russ performed and provided DJ services for our yearly Port Padre Day. On Saturday August 19, the Port of San Diego and its 650 employees and their guests gathered at Qualcomm Stadium for sun, fun, food, and entertainment before the game. While the crowd ate and mingled, Russ provided the perfect mix of music and interactive entertainment that we were looking for. Russ is very friendly and gregarious, the employees and their guests took to him instantly and before you knew it we had people standing in line to do Karaoke. Russ is extremely timely, organized and efficient and we hope to see him at future Port of San Diego events! Everyone had a great time! The mix of music was outstanding! You were able to get the crowd motivated even with all the other activities. That's saying a lot! I had many comments on how friendly and how you never turned a deaf ear to special requests! My hat's off to you for making the evening a success! We're looking forward to next year! We had the pleasure of hiring Musical Excitement with Russ for a Luau party. Not only did he entertain with his humor, good voice, and enthusiasm, but he went the extra mile to include specialty props and music. My husband and I were impressed by his professionalism and expert advice in ensuring our party's success. We would highly recommend his services to anyone planning a gathering to be remembered and cherished for years to come. Russ, Things have finally slowed down enough, that I can get a short thank-you note off to you. The Hi-Tech Welding Christmas Party was so much fun, thanks to you. Your choice of music played during our dinner was perfect. Kept the mood light. When it came to the after dinner entertainment you had a tough group on your hands, but you managed to get everyone up, karaoke singing, dancing and really having a good time. We will definitely keep you in mind and recommend your services for any future parties. Again, thank-you so much!! The music was very appropriate for the age level and the type of event. Furthermore, Russ does a great job getting the students involved interactively so all students can be included and participate. I've appreciated that he has been able to know the expectations of our school so the students have a meaningful and fun experience. I hope he is our DJ for years to come...GREAT JOB! I organized our first annual Girl Scout Father-Daughter Dance for about 150 people. In all the pre-planning that went into organizing the dance, I was fortunate enough to come across Musical Excitement with Russ for our DJ services. Aside from the fact that Russ McKamey had the most competitive price, his services also included all the "bells and whistles" at no additional costs. It was quite a savings for us. The Dance was a great success. Russ was very enthusiastic and kept the dance moving at a fun pace. That's no small feat considering a lot of the girls were very young. Russ is well organized and has shown to be very dependable. I will recommend his services to anyone. In fact, we are already looking forward to next year's Father-Daughter Dance! Russ was the best! Several other DJs wanted to raise the price when they knew it was for a wedding. Russ came to my house and met me and my future husband and we instantly became friends. My sister sang at the wedding and Russ was eager to ensure we all heard her and she was comfortable. Everyone was dancing and we had a GREAT time. Thank you for a GREAT wedding. 5 STARS PLUS - Highly recommended! Russ is an awesome DJ. The 8th graders loved him. That is a huge compliment, because teenagers are hard to please. They went through several DJs this year and the only one they liked was Russ. The adults enjoyed him as well. I personally liked him so much that I recommended him to two of my friends who are getting married. He would be the perfect choice for any occasion!! Dear Russ, Thanks to your professional vocals and DJ service, Deer Canyon's first ever Sock Hop on February 9th was a complete success. Your expertise in working the crowd kept the people rocking for the entire two hours! We are looking forward to having you back to our school again next year for yet another "be-bopping" good time. This has been our second year with Russ and we loved it. The kids were engaged and the music selection was what they liked without promoting inappropriate dancing. Russ keeps the evening moving and was great about making any announcements we needed. We love the way he involves everybody...kids, parents and teachers. We'll see him again next year at out graduation, and every year after that. He's the best!